Jan De Nul Group has successfully completed the cable installation scope for the Phase II Full Field Development of the NASR offshore oil field. 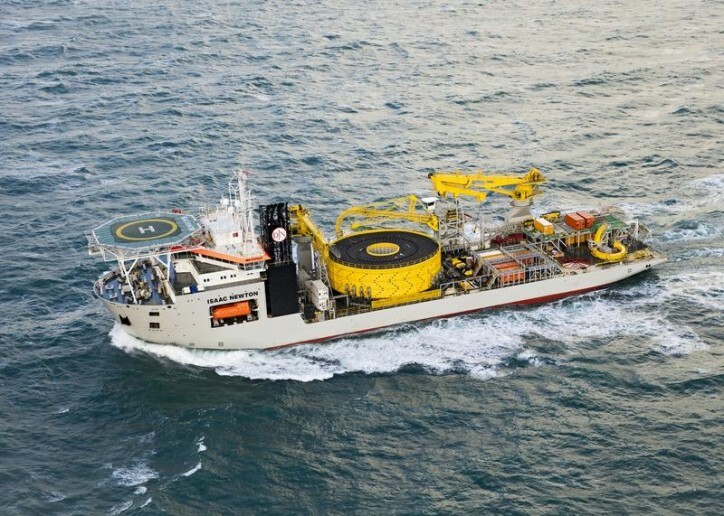 Jan De Nul Group was subcontracted by Hyundai Heavy Industries for the cable loading, transport, laying and protection of three 132kV subsea power cables (total length 147km) and ten 11kV subsea power cables (total length 57km). The NASR oil field is located approximately 130km northwest of Abu Dhabi and the project is part of the ADNOC strategic development programme to increase the field’s capacity to 65,000 barrels per day. A total of 204km of cable was loaded in Norway, and transported and installed at the project site in two separate trips with the Cable Laying Vessel Isaac Newton. Thanks to Isaac Newton’s unrivalled cable carrying capacity, the longest and heaviest of all thirteen cables, being the 71km long and almost 6,000 tons heavy 132kV cable between Das Island and the NASR field, could be installed in a single length. The vessel capability was further demonstrated with the accurate installation of these subsea cables between multiple platforms and well head towers within the congested seabed of the oil field. Furthermore, the multipurpose vessel Daniel Bernoulli demonstrated on its maiden project the versatility for which it was designed by executing the full cable protection scope including 53km of post-lay trenching, the installation of 671 concrete mattresses as well as 8km of rock berm installation. Being at a significant distance offshore and by careful deck management, the vessel was equipped to carry out both mattress installation activities and subsea trenching activities sequentially maximising vessel efficiency. In addition, a rock berm protection for subsea cable was designed and incorporated for the first time in the ADNOC offshore fields thanks to the in-house engineering expertise of Jan De Nul Group.